I don’t eat rice anymore. It’s high glycemic, gmo, nutritionally void food, in my opinion. I don’t really miss it, either (or what it did to my blood sugar). That’s it! 5 simple ingredients. I started by sautéing the entire bag of organic broccoli slaw from Trader Joe’s (it’s the only place I’ve seen broccoli slaw like this. Shredded carrots and shredded broccoli stalk), in a little Tropical Traditions Coconut Oil. I lightly seasoned with kosher salt/pepp, and continued sautéing until it had really cooked down. I broke 4 eggs into the same pan, and began stirring (thinking this would just be a yummy scramble). 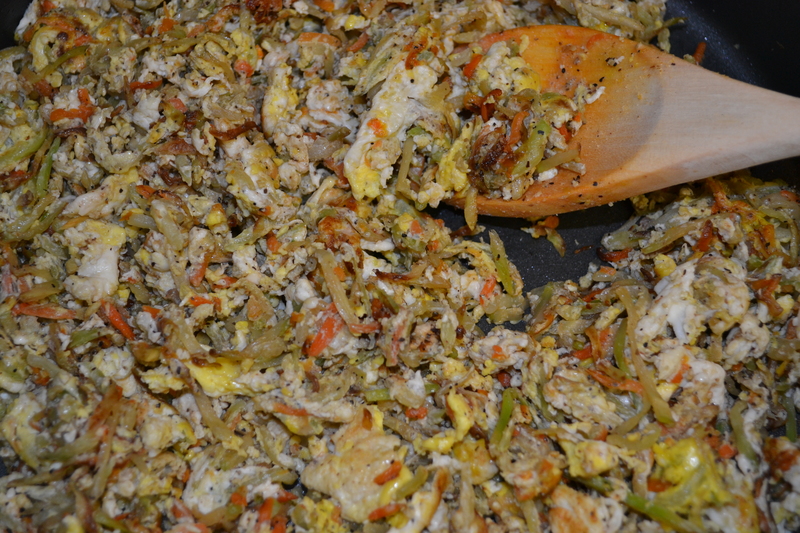 Then it started to resemble fried rice, but needed more egg, so I broke two more in the pan. I cooked for maybe 10 minutes longer, stirring constantly making sure the egg was cooked thoroughly and broken up well. Since it looked so much like fried rice, I decided to treat it as such, and sprinkle with coconut aminos (soy-free soy sauce, therefore gluten free! ), it was TO-DIE-FOR. What the heck. Re-heated even better the next day! So easy and flavorful. This entry was posted in Randoms and tagged Broccoli Slaw, Coconut Aminos, Fried Rice, Paleo, Rice Free, Soy-free, Trader Joe's, Tropical Traditions Coconut Oil by livinglikelinds. Bookmark the permalink. I am T1D 3 1/2 years, in the same food adventure as you… I have decided that upstate NY needs Trader Joes! Love your blog, love your food creativity … Keep sharing! Wow, thanks Jean! Everywhere needs a Trader Joe’s 😉 You could always get shredded cabbage/carrot mix, and try that? Hope you’re well and thanks for reading!! Woohoo! Hope you like it!! I think you should come home and make this for me and dad!!! What the heck are coconut aminos? Looks delicious, think it would work with egg beaters? Coconut Aminos is a much healthier soy sauce substitute, read more here, so much healthier! http://www.coconutsecret.com/aminos2.html Also, you could try to make this dish with egg beaters, but honestly, they’re so horrible for you. Read about them here: http://www.ncbi.nlm.nih.gov/pubmed/4856709 What they do to your body is disgusting and a little frankenstein-ish. I made this this weekend and loved it! I only used 4 eggs instead of six but it was awesome! And like you said, even better the next day! Thanks for sharing that recipe! I made this several months ago and decided to add more eggs and onions the next time: egg foo young! !